Please see "Dobashi et al. 2005, PASJ, vol.57 SP1, pp.S1-S386" for details ! Here we release the first version of the atlas and catalog of dark clouds derived by using the optical database Digitized Sky Survey I (DSS). Applying a traditional star-count technique to 1043 plates contained in DSS, we have produced an Av map covering the entire region in the galactic latitude range |b| ≦ 40 deg. The map was drawn at two different angular resolutions of 6' and 18', and is released in FITS format on this website. Based on the Av map, we identified 2448 dark clouds and 2841 clumps located inside them. Physical parameters, such as the position, extent, and optical extinction, were measured for each of the clouds and clumps. We also searched for counterparts among already known dark clouds in the literature. The catalog of dark clouds presented here lists the cloud parameters as well as the counterparts. Printed version of the atlas and catalog has already been published in a special issue of Publications of the Astronomical Society of Japan (PASJ) in 2005 February (Dobashi et al. 2005, PASJ, vol.57 SP1, pp.S1-S386). Electronic version of the paper can be found at http://pasj.asj.or.jp/v57/v57sp1.html. Please look into the paper for detailed explanations of the data. The price is 3,900 yen for one copy, including postage. The atlas and catalog of dark clouds shown in the special issue of PASJ are released in FITS and text files on this website. We have drawn maps in the atlas at two different angular resolutions (6' and 18'), and refer to them as high- and low- resolution Av map, respectively. The high-resolution Av map is to identify well-defined and relatively small dark clouds, and the low-resolution Av map is to find diffuse and extended clouds. For details, please read our paper in PASJ. On this web site, the lists of clouds summarized in Tables 7-10 in our paper are given in the text files (ascii), and the Av maps displayed in Figures 7, 9-17, and 20 are released in FITS format. Simple explanations for these figures and tables are summarized in the following table. Column format of the ascii files (i.e., Tables 7-10) are given at the end of this document. Catalog (ascii file) and atlas (FITS file) released on this web site. Table 8 (p.S167): List of associated dark clouds in the high-resolution Av map. Table10 (p.S198): List of associated dark clouds in the low-resolution Av map. Figure 20 (p.S367): Low-resolution Av map covering the entire surveyed region. Figure 9 (p.S200): High-resolution Av map for "Region 1". Figure 10 (p.S202): High-resolution Av map for "Region 2". Figure 11 (p.S204): High-resolution Av map for "Region 3". Figure 12 (p.206): High-resolution Av map for "Region 4". Figure 13 (p.S208): High-resolution Av map for "Region 5". Figure 14 (p.S210): High-resolution Av map for "Region 6". Figure 15 (p.S212): High-resolution Av map for "Region 7". Figure 16 (p.S214): High-resolution Av map for "Region 8". Figure 17 (p.S216): High-resolution Av map for "Region 9". Copyright of the text and FITS data on this web site entirely belongs to Tokyo Gakugei University. However, the data can be used by anyone for astronomical research and education purpose. We request users of the data released on this web site to refer to our paper "Dobashi et al. 2005, PASJ, vol.57 SP1, pp.S1-S386" when they use the data for publications (papers or articles). This is important not only for us but also for users, because your referring to the paper would greatly encourage us to find a financial support to maintain and develop this web site. We would very much appreciate your contribution. We should note that there is an editorial error in the printed version of the data. Figure 13b in page S208 (Dobashi et al. 2005, PASJ, 57) was unfortunately replaced by Figure 13d by accident. An appropriate Figure 13b can be found in the erratum of PASJ (2005, Vol.57, No.2, p.417), or can be downloaded from this web site (Figure13b.jpg). The error has been already corrected in the electronic version of the paper which one can download from "http://pasj.asj.or.jp/v57/v57sp1.html". We have done our best to guarantee the high quality of the data, but there might be some errors. If you should find an error, please let us know via e-mail (dobashi at(=@) u-gakugei.ac.jp), so that we can revise the data immediately. If you have a question, suggestion, or request about the extinction data, please send an e-mail to me Kazuhito DOBASHI (dobashi at(=@) u-gakugei.ac.jp). Byte-to-byte explanations of the ascii files (Tables 7-10) are given in the following. Table 7: Catalog of dark clouds and clumps identified in the high-resolution Av map. 1- 4 I4 --- --- Sequential number for cloud name. 6-10 A5 --- --- Sequential number for clumps identified in each cloud. 12-17 F6.2 deg L Galactic longitude in degree of the clouds and clumps. 19-24 F6.2 deg B Galactic latitude in degree of the clouds and clumps. 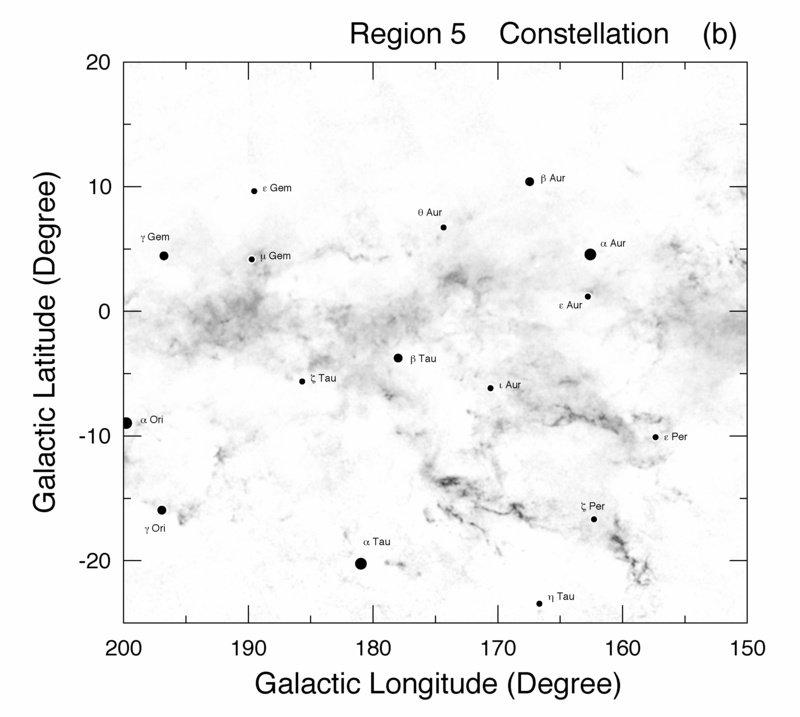 26-30 F5.2 deg dL Extent of the clouds and clumps in galactic longitude in degree. 32-36 F5.2 deg dB Extent of the clouds and clumps in galactic latitude in degree. 38-45 E8.2 deg^2 S Surface area of the clouds and clumps in square degree. 47-50 F4.1 mag Av1 Peak Av value of the clouds and clumps in the original Av map. 52-55 F4.1 mag Av2 Peak Av value of the clouds and clumps in the filtered Av map. 57-60 F4.2 mag dAv Noise level. 80-81 I2 --- Nassoc Number of counterparts found in the literature. (=<2) found in the 6' resolution. Table 8:List of associated dark clouds in the high-resolution Av map. Bica (2002).The largest record is N=1254. Table 9: Catalog of dark clouds and clumps identified in the low-resolution Av map. 1- 3 I3 --- --- Sequential number for cloud name. 5- 7 A3 --- --- Sequential number for clumps identified in each cloud. 9-14 F6.2 deg L Galactic longitude in degree of the clouds and clumps. 16-21 F6.2 deg B Galactic latitude in degree of the clouds and clumps. 23-27 F5.2 deg dL Extent of the clouds and clumps in galactic longitude in degree. 29-33 F5.2 deg dB Extent of the clouds and clumps in galactic latitude in degree. 35-42 E8.2 deg^2 S Surface area of the clouds and clumps in square degree. 44-46 F3.1 mag Av Peak Av value of the clouds and clumps. 48-55 F8.2 mag deg^2 SAvds Extinction integrated over the surface area. 57-57 I1 --- Nassoc Number of counterparts found in the literature. 59-59 I1 --- Flag Flag for a large cloud extending outside the Av map. Table 10: List of associated dark clouds in the low-resolution Av map. and Bica (2002). The largest record is N=74. This website is financially supported by Grant-in-Aid for Scientific Research (Nos. 178059, 188065, 198049, 208040, 218044, 228037, 248028, 258031, 15HP8026 and 16HP8023) of Japan Society for the Promotion of Science (JSPS).